Seven brilliant novels from one of contemporary women's fiction's best writers. 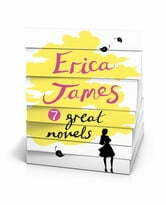 Full of Erica James's signature warmth, wit and compelling characters. Comprises: AIRS AND GRACES; ACT OF FAITH; PRECIOUS TIME; HIDDEN TALENTS; LOVE AND DEVOTION; GARDENS OF DELIGHT; TELL IT TO THE SKIES. Loved it to the end! !